Today is Mailbox Monday, and here are the goodies that arrived in my mailbox since last Monday. For ages 8-12, this book will be released in November and according to the publisher, presents "the facts, drama, and one-of-a-kind anecdotes that make football such a popular sport." What makes that toy glow in the dark? Why do my fingers get so wrinkled in the tub? My daughter and I have started going through the book, and at 3 1/2, she is able to grasp the explanation of most questions. Her favorite so far, is "Why are some eggs brown and some eggs white?" There's a surprising fact about a type of South American chicken that lays blue eggs. My only pet peeve? No sources are listed. Ahhhhhh!!!!!! From Random House Books for Young Readers is Rebecca Barnhouse's The Coming of the Dragon. From the publisher, "Rebecca Barnhouse weaves Norse gods, blood feuds, and a terrifying dragon into this spectacular retelling of the end of the Old English poem Beowulf." As an English Lit major, Beowulf was on many a course syllabi, so I have to admit this is intriguing. The book goes on sale tomorrow. So that's what was in my mailbox this week. What was in yours? Visit today's Mailbox Monday roundup at She Reads and Reads. So, I'm participating in Mailbox Monday for the first time ever. Not sure why it took me so long because I love reading other Mailbox Monday posts to see what books other bloggers have received. What is Mailbox Monday? It's a weekly round-up of books people have received in the mail during the previous week. Started by The Printed Page, it's now hosted by other blogs, alternating monthly. This month, She Reads and Reads is hosting. This week, I received a lot of Middle Grade and Young Adult books and one picture book. The picture book is Tell the Truth, B.B. Wolf by Judy Sierra, illustrated by J. Otto Siebold (Knopf, 2010). It's a follow up to their 2007 hit Mind Your Manners, B.B. Wolf. In this book, B.B. Wolf (a.k.a. Big Bad Wolf) faces skepticism from some favorite storybook characters when he starts telling HIS version of the Three Little Pigs. To make up for blowing the pigs' houses down, he decides to do a good deed. It's super cute. Now the only challenge is deciding which one to read first! Books mentioned in this post were received as review copies from the publishers. The links in this post are affiliate links. With every purchase you make through clicking on these links, you are helping support The Well-Read Child. Happy Nonfiction Monday, a day when we celebrate great nonfiction for kids and young adults. Today, I'm offering a review of a new nonfiction book for smaller kids. 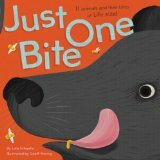 In Just One Bite, kids get life-sized examples of what eleven different animals, from a worm to an elephant, eat and how much of it they CAN eat in just one bite. In Geoff Waring's eye-catching illustrations rendered in brush, crayon, and computer, you see a life-sized frog catching a beetle with its tongue, a parrot eating a nut, a Komodo dragon slurping a snake down its gullet. The big finale is a four-page fold out of a sperm whale eating a giant squid with one big gulp. The back matter includes brief paragraphs about the eating habits of each of the book's featured animals. I was also super excited to see the author acknowledge the sources consulted for writing the book on the copyright page. It offers a lot of credibility to the book. Thus, I'd definitely recommend it for both home and early-elementary classroom use. Check out the other Nonfiction Monday selections at MotherReader. On Sundays, we try to have a relaxing day with the kids before the craziness of the new week begins, and one of our favorite activities is to read and tell stories. On most Sundays, I plan to share a story we've been reading, and I invite you to share yours in the comments. One of the stories we've read this week is Louise Yates' Dog Loves Books. As you can probably guess from the title, it's about a dog named Dog who loves books. Dog loves books so much that he opens his own bookstore. When business is slow, Dog gets discouraged until he picks up a book and reads to pass the time. He's taken away on many adventures, and when a customer finally comes, he knows exactly which books to recommend. The story is simple and to the point, but what I love about it is that it really shows the magic of reading and the fun that comes with introducing others to the books you've read. The illustrations themselves are just as charming and perfectly complement the story. When Dog is reading, he is surrounded by colorful dinosaurs, hopping kangaroos, and green aliens. This is definitely one that we'll read again and a book that makes for a great read-aloud. If you haven't stopped by the Cybils website and nominated your favorite children's and young adult books of the year, please do so by October 15. They've already received tons of nominations in the different categories, but if you have a favorite that hasn't yet made the list, nominate! Read the nomination rules here. The Children's and Young Adult Blogger and Literary Awards. 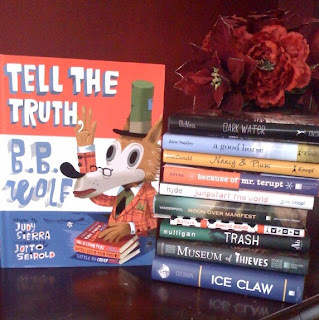 The awards are a great way to celebrate children's and young adult books that have kid appeal. Every year, my book list gets bigger as I strive to read all of the books that make the shortlists. Board Books! Board Books! Board Books! With a super busy 8-month-old who is not so gentle with things, especially books, I've remembered how important it is to have a stash of board books around for him to play with. I've put accessible books that can withstand a beating in nearly every room of the house and also have a stash for the car and diaper bag. At this stage, he'll touch pictures and is able to flip the thicker cardboard pages. He rarely stays still long enough to get through more than one book and loves "eating" them more than anything. But at eight months, that's all I can really ask for. Introducing babies to books and letting them explore them is an early introduction to literary, and I know at least for me, having board books around offers my baby the opportunity to play with books without the fear that he'll rip a page or poke himself with a sharp corner. I've also found board book versions of some of my three-year-old daughter's favorite books. She loves to "read" them to him and show him pictures. Here are some newer board books we are enjoying. In the latest "Pookie" installment, many parents will find this scene all too familiar as Little Pookie wakes up way too early on his birthday and just can't get back to sleep. Once Pookie's finally wake up, the day is filled with birthday festivities. If you know the Pookie books, this one has the familiar rhythm and cute pictures that really engage young children. It's fast and it's fun...perfect for little ones. We've been fans of Tricycle's "Busy Book" series from way back. See reviews of other books in the series here, here, and here. In the next installment of the series, set to release next week, kids come face-to-face with busy gorillas in action. It has a great mix of photographs from baby gorillas to adult gorillas, and This came in the mail just this past Friday, and my daughter absolutely LOVES it. Over the weekend, she kept picking it up and saying, "Look at this guy, Mommy." The baby loves it, too, and we're so excited for the next book, Busy Elephants, to come out in February. Seriously, if you're looking for a series of long-lasting books, these have been favorites of my daughter's since 2008. I know what you're thinking...not another alphabet book, but I promise this one is really cute. Each letter of the alphabet features a scene with a baby getting love and attention from friends and family. A is "Adore Me," B is "Bathe Me," C is "Cuddle Me," and so on. The soft illustrations of happy babies of many different races make this a heartwarming book that I wouldn't hesitate to give to any new parent or grandparent. 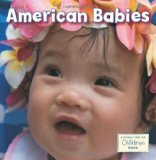 We've read The Global Fund for Children's Global Babies (see my review here) over and over again, so I was delighted to receive a copy of American Babies. In the same spirit as Global Babies, American Babies introduces you to gorgeous photographs of diverse babies all across the U.S. Brief text on every page sends a positive message about the love babies bring to the world. I think I love this book just as much as my little ones do. What about you? What board books are you reading with your children?